Toiletry bags are some of the most practical bags a person can own. Large or small, expandable or compact, they can help you save space, stay organized or take your entire bathroom with you when traveling. Toiletry bags aren’t meant only for women’s use, but also for well-organized men that want to be prepared for any situation. Finding the best toiletry bag for your needs should be easy enough, if only you know what to look for. What are the features that you are looking for in a toiletry bag? Functionality, size, design, high-quality materials? Or do you simply want it to be cheap and classical? Either way, today’s market can offer you a variety of options. If you are a pretentious one and you are willing to search well enough for the best toiletry bag, you might even find designer bags. In case you aren’t and all you want is to buy a durable, stylish and practical bag that you can take with you anywhere you go, you are in the right place. In this article, we gathered five of the best products available on the market right now and we reviewed them for you. We looked at how practical they are, at the design, fabric, size, number of dividers and ease of use. Also, we compared their prices, as we think it is important to make the right investment. 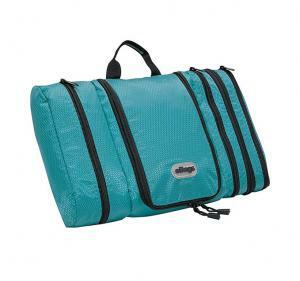 Are you in search of an inexpensive toiletry bag that can be used by the entire family? This is a large-sized bag and organizer, an all-in-one bag that has one main compartment, two side pockets, and one front pocket. The smaller pockets have elastic loops that will secure your bathroom and personal care products and prevent them from falling. 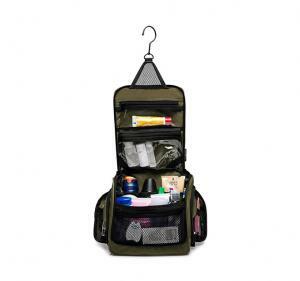 When buying this toiletry bag, you can choose between red, blue, black, khaki, purple or army. Just like the eBag, this toiletry bag can be hanged using a hook when not traveling. Another great thing about this bag is that it has a sturdy bottom that keeps the bottles straight up. More than that, the bag is covered by a lifetime guarantee. In case you don’t like it, you can get your money back, no questions asked. The fact that this toiletry bag is large sized will convince you from the first glance if you like to take as many personal care products as possible with you in your travels. Also, if you travel with your family often, it is very likely that you will find such a product useful. The compartments are well-organized, and the fact that it has a sturdy bottom helps you ensure that everything will stay in place. This product comes with plenty of advantages. However, even though it is made of an impermeable fabric, it is not completely water resistant. Also, the strap that it attached to the hook does not seem to be very sturdy. You might want to avoid hanging it if it is too heavy. If you consider yourself to be a classy person and you pay very close attention to details, this toiletry bag is suitable for your tastes. It is, with no doubt, one of the best models, from an aesthetical perspective. Its vintage design and lower zipper than hides a separate compartment make it practical and ideal for highly organized individuals. 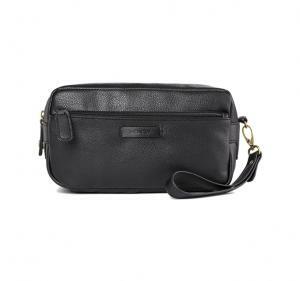 This is a men’s toiletry bag that is made of waterproof leather and lining. It also has a waterproof inner bottom that ensures that your belongings will not be affected by water. It comes with two large compartments where you can fit a wide variety of travel accessories. More than that, it has two zipper pockets on the inside and two travel bottles that will be of great help if you are traveling by airplane often. The best thing about this vintage toiletry bag is that it is covered by a lifetime guarantee. 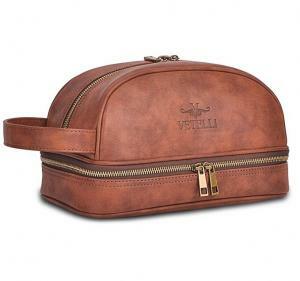 What’s to like about Vetelli Leather Toiletry Bag / Dopp Kit for Men + Travel Bottles? The unique design of the Vetelli toiletry bag will make you fall in love with it. Its compact and lightweight shape makes it highly portable, and you will feel proud of it in case someone else gets to see it. The inner pockets can help you organize your personal belongings in a more efficient way. It measures 11 x 6.2 x 6.1 inches (28cm x 16cm x 15.5cm), which is just the right size for you if you travel a lot. Even though this men’s toiletry bag is stylish, nicely designed and affordable, it comes with minor flaws, such as the inner zippers. They seem to be made from plastic and make you question whether they are durable or not. If you are more of a casual person and you like sporty accessories, then this bag is exactly what you are looking for. It has an athletic design with plenty of zipper closures, and it comes in several colors. You can choose between blue, pink, gray, green and yellow. It is highly functional and can be used both for traveling and for the home. It can be hanged in the bathroom using an included hook, or it can be closed up and packed with the rest of your stuff. The great thing about it is that it is made of Techlite Diamond Nylon and it comes with self-repairing coil zippers. It encompassed four compartments, out of which the center section is the widest. What’s to like about the eBags Pack-it-Flat Toiletry Kit? It is amazing how such a compact bag can fit so much in it. From personal care products to accessories, shaving machines, and make-up accessories, everything fits inside. It has a 2.25 x 9.25-inch center section, a right side of 3.5 inches and a left side of 3.75 inches wide. The damp contents are stored with PVC film. While this bag’s size is great because of the large number of items that it can fit in, some people would say that it is a bit too large for traveling. Let’s say that it is perfect for long-term travels! Not all toiletry bags are as huge as the above three products. This one is considerably smaller, as well as its price. This is a travel bag that is also an organizer and comes in a much more compact shape. Just like classic toiletry bags, it has a rectangular shape, and it is easy to maneuver thanks to its side handle. It is great for personal care product carrying, and it is roomy enough to allow you to take everything that is important with you. One of this bag’s advantages is that it has inner pads that are meant to protect the products inside, no matter how fragile they are. At its size of 4 x 10 x 6.75, it is a perfect travel bag and organizer. 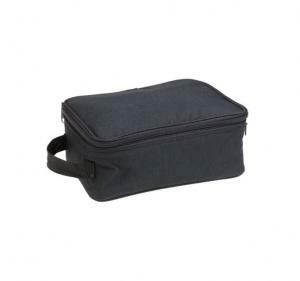 Why buy this grooming toiletry bag? What’s to like about the Household Essentials Grooming Toiletry Travel Bag Organizer for Men and Women, Black? This bag’s design is highly convenient for short and long travels, as you can fit in it a lot of care products, as well as accessories. It has a zipped lid that includes another pocket and two practical, elastic straps, which prove to be useful when you have a lot of tiny objects that you want to carry with you. Its classic aspect makes it suitable for everyone in the family, which is a big plus. Although this is certainly a practical, simple bag, it wouldn’t hurt if it had two or three dividers inside, just so the products can be kept separately. Other than that, this is a product that offers value for money. The Dopp Kit is a stylish travel bag that comes in black and is made of grain leather. It looks good and it proves its functionality due to the zipper closure, side large handle and inner pockets. Although it is not as large as the previously described products, it is suitable for the times that you have to take off for a few days and take the necessary personal care products with you. It is roomy enough to fit in both cosmetics, toothbrushes, creams or shaving kits, but it is not the best choice if you want to travel for a long time and you need more than just a few cosmetics. This toiletry bag has an exterior metal zipper that looks durable enough and a side zipper that closes up another small pocket. Its beauty is given by the details of the handcraft and if you are a person who pays close attention to details, you will come to love it. What’s to like about the Dopp Kit, Travel Toiletry Kit Bag, Double Zipper Cosmetic Makeup Bag for Men Women? Today’s market is filled with accessories that are either too colorful or too kitschy. If you are looking for something classy, compact and simple that you want to put your travel products in, this is the ideal bag for you. Either you are a man or a woman, you will find it practical and you will use it with confidence, no matter where you are. Also, its price is affordable. It is elegant, small and multifunctional. Just like any other small travel bag, the Dopp kit lacks the advantages that the dividers and organizers offer. Sometimes, the bottles will be too close to one another and will make awkward noises and other times, all your products will be mixed up and it will become difficult for you to find something, if in a rush. Why is a toiletry bag essential for your travels? In the past, we weren’t really bothered by having to throw all of our body and face care products in one basic bag or even in the middle of the luggage when traveling. The world is more organized than ever, and you can find organizers for everything. Although the first situation resonates more with a hippie personality and the “don’t care” attitude is somewhat refreshing, the truth is that organization brings a lot of benefits. First of all, it contributes to our comfort, helps us find the things we need when we need them and allows us to focus on more important things while traveling. Did it ever happen to you to look for minutes on end for something in your luggage? If the answer is yes, then you know how frustrating it gets. Toiletry bags prove to be very practical. They are special bags that you can use to organize your personal products, make-up products, hygiene products and so on. These products are usually roomy, have several compartments or dividers, are waterproof and durable. Do toiletry bags help you be more organized? Toiletry bags are especially recommended for those who can’t manage to stay organized no matter what they do. This accessory helps you keep everything together. More than that, it allows you to put it somewhere handy, as most models come with a hanger and have a foldable design. Imagine that you have just arrived at the hotel, you need to do the check-in, take a quick shower and meet your friends. Instead of having to look for all the necessary products, taking the time to put them somewhere at hand and stressing about not forgetting something when you leave, you will simply use them and place them back in the bag. When opening the luggage, you will know that all of your products will not be scattered all over the place. You will always find them in your toiletry bag. What to look for in a toiletry bag? There are a few features that you should look for in a toiletry bag, stating from materials, compartments, durability and more. One of the most important elements that you should pay attention to is waterproof materials. The number of dividers is also important. Some models come with mesh pockets and some with zippered pockets. In this case, more always means better. If the toiletry bag that you like has plastic pockets, then you should think no more and buy it immediately. It will make airport screenings so much easier, that you will forget about the whole airport-related stress. Another important accessory is the hanger. It is much more comfortable to be able to hang your bag somewhere close to the mirror, for example, then keep it in your luggage, in a closet or somewhere where it occupies space. Giving the fact that even the best toiletry bags on the market aren’t very expensive, this is a product that is really worth buying. Toiletry bags are accessories that cannot miss from your travel requisite, especially if you are an organized persona and you like everything to be put in its place. When using such a bag, you will know where to find everything. More than that, if you choose a large toiletry bag that can be used as an organizer, it is like buying a new piece of furniture for your bathroom. These products are so roomy and so comfortable to use, that you start wondering why you didn’t have such a product before. Not sure what to choose? Think about your everyday needs and how much you travel. If you are a busy person but you don’t travel much, choose a travel bag that is small, compact and fits in your daily purse or backpack. If, on the contrary, you travel a lot on long distances, you better choose a larger organizer that helps you ensure that you have everything that you need with you. Regardless of the toiletry bag that you will choose, make sure that it is high-quality, made of durable fabrics and that you are satisfied with its design.